Which Multivitamins Should You Take on Atkins? The Paleo diet is also known as the Paleolithic, Stone Age or Cave Man diet bases its nutritional guidelines on the diets consumed hundreds of generations ago. In a nutshell, the Paleo diet states that if your ancestors didn’t eat it, neither should you. The Paleo diet has some similarities to the dietary recommendations for bodybuilders and for those who hope to reduce fat and improve muscle mass. There are several touted benefits associated with the Paleo diet. Promoters maintain it can help clear acne, promote weight loss, increase energy and enhance your athletic performance. Creighton University points out that the diet of our ancestors failed to include a number of foods that should be part of a nutritionally balanced diet, specifically beans and dairy products. The Paleo diet does call for fruits (strawberries, blueberries), root vegetables (carrots, turnips) and nuts (almonds, Brazil nuts). Protein is the most important aspect of the Paleo diet regime. It calls for eating plenty of chicken, eggs and fish, all of which are promoted as good bodybuilding foods. 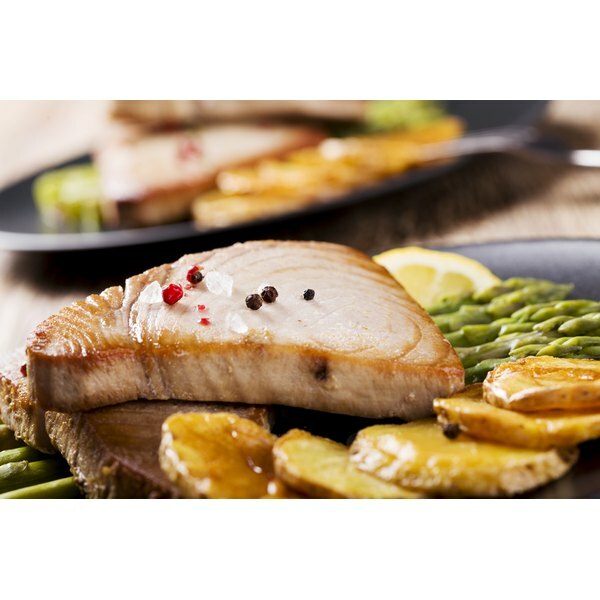 Fish is an excellent source of omega-3 fatty acids, which promote overall health and may encourage muscle growth. According to Bodybuilding.com UK, protein is a staple of a bodybuilding diet because it repairs and strengthens muscle tissue. The Paleo plan may require some fine tuning in order to be a desirable bodybuilding diet. Overall it provides the essential nutrients for optimum health. Dietary considerations are only part of a bodybuilding regime. Increasing your muscle mass also requires regular physical activity that includes a weight training program. Consult with your doctor before starting a new diet. What Vitamins Are in Peanuts? Which Nutrients Are in Beef Steak?